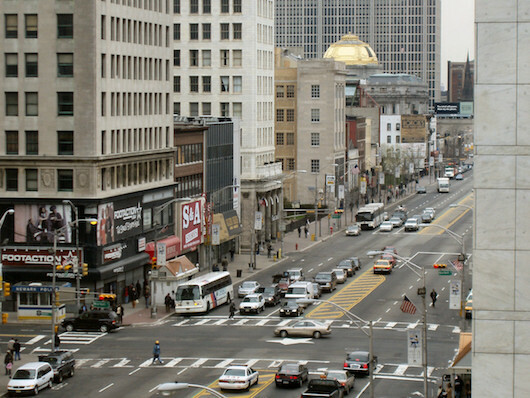 A run in downtown Newark features some interesting history, architecture, and variety. We’ve put together a 6-mile ‘runseeing’ tour, with three distinct sections, each about 2 miles: the area near the train station, which features some real architectural gems; a section along the continually improving waterfront, and the historic Ironbound, now a mainly Portuguese-Brazilian neighborhood. Start at Newark Penn Station, designed by McKim, Mead and White in the art-deco style. The first mile of the run is along Newark’s two important commercial thoroughfares, Market St. and Broad St. Combination of high-rises, Prudential Center arena, New Jersey Performing Arts Center, and some architecturally interesting buildings. After a quick loop around Military Park, head to Minish Park and east along the water: Center-City Dock-Commercial-Raymond streets, to Riverfront Park along the Passaic River. The final section of the run comes up Brill St. to Ferry St., doing a loop around the Ironbound district and the lovely Independence Park, using Van Buren St. and Adams St., before heading back along Ferry St. to the end. Notes: The run can be shortened by cutting out any of these ‘2-mile’ sections. Best done during the day.